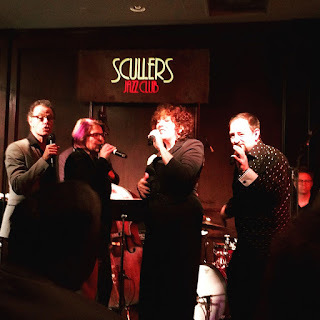 This past week I had the great fortune of seeing Manhattan Transfer at Scullers Jazz Club. A vocal jazz group, Manhattan Transfer utilizes vocalese, which is a style of jazz singing that places words to melodies that were originally part of an all-instrumental composition or improvisation. To understand vocalese, listen to both versions of "Moody's Mood For Love" below. The first one is James Moody on saxophone. He plays "I'm In The Mood For Love" then improvises. Notice in the second version vocalist Eddie Jefferson takes Moody's improvised solo and adds his own lyrics. Pianist-bandleader Bennie Moten wrote "Moten Swing" for his Kansas City Orchestra. This band was a regional, blues-based orchestra that included Count Basie on piano. "Moten's Swing" helped to develop the riffing style that would come to define many big bands of its day, and became a classic in Basie's own band later on. 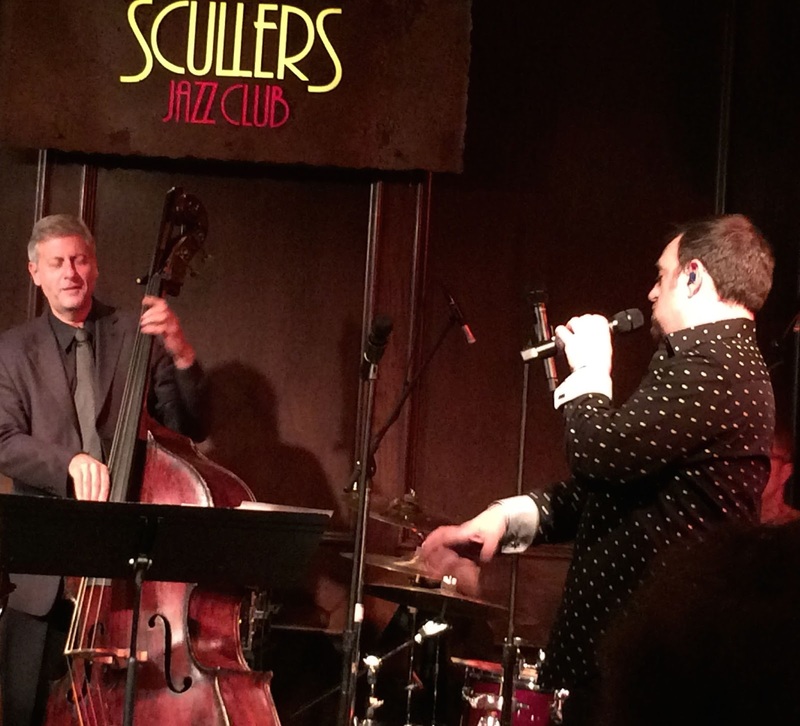 With the vocalese added, Manhattan Transfer was able to sing "Moten Swing" with lyrics. I enjoyed how they imitated each instrument with the tonal quality of the vocal. The group even pretended to hold a trumpet mute while singing the original trumpet part. Pianist-bandleader Horace Silver was known for his bluesy, gospel-based songs and his distinct hard bop sound. "Doodlin" was originally released on the 1956 album Horace Silver and the Jazz Messengers, which included Art Blakey on drums. Some of the pioneers of vocalese were jazz vocalists Dave Lambert, Jon Hendricks and Annie Ross. They are well known for their 1957 album Sing a Song of Basie, where they set lyrics to Basie repertoire. "Corner Pocket" was written by Count Basie's guitarist, Freddie Green, for the album April In Paris. Freddie Green is known for his rhythmic guitar playing, defining the beat with each chord. In the vocalese version of "Corner Pocket," Manhattan Transfer rearranged the original to fit a vocal ensemble. In their Scullers performance, the group captured the buoyant energy of the Basie band with heavy swing and bends in the lyrics to mimic a horn. "Joy Spring" was written by trumpeter Clifford Brown for the definitive Clifford Brown & Max Roach, also featuring drummer Max Roach. Clifford Brown is widely considered one of the great all-time trumpeters, leaving a legendary body of work even though he passed away from a car accident at the age of 25. Vocalese can mimic classic bebop and hard bop songs by allowing the vocalist to speed through lines with lightening fast diction. It was interesting to hear the added level of a lyric to Brown's solo. "Birdland" was written by keyboardist Joe Zawinul for the jazz fusion band Weather Report for their album Heavy Weather. "Birdland" serves as a tribute to the New York City jazz club Birdland, which was named after Charlie Parker's nickname, Bird. Manhattan Transfer's version of "Birdland" was high spirited, danceable and electric. Each member of the group has amazing solo abilities, projecting their voice as a horn while still blending as an ensemble with balance and control. Hearing the original song and the vocalese helps show the transformation. And what a transformation a well-formed lyric can do! Please visit my jazz poetry blog, "Without a Poem", where I improvise a new poem everyday! I also share jazz music and art there, so stay tuned! This week inspired my poem, "Joy Spring." I am excited to be a journalist for this year's Detroit Jazz Festival. The world's largest free jazz festival, this year has an amazing lineup including Gordon Goodwin's Big Phat Band, Eddie Daniels, Carla Bley, Danilo Perez and Artist In Residence Pat Metheny. I highly encourage everyone to make the trip to Detroit to celebrate what's sure to be a marvelous Labor Day weekend! Read my preview of the festival here.